See Seattle Tall Poppy's review of this cookbook and the Seattle launch party for the book. See Lisa is Cooking's review and her take on Fleur de sel caramels, Honey caramels, Bittersweet citrus tart with jasmine cream and Sesame seed cake from this book. The book's appealing concept is accurately expressed by the subtitle. It's also a near-perfect cookbook from the physical and formatting p.o.v. : compact and manageable, one recipe to a page, beautifully photographed result near at hand. Easy-to-locate and legible chapter tables of contents with page numbers. Good index (less important for EYB members, but still). Would make an excellent gift to cooks at almost any level of experience. One complaint: The worthwhile two- and three-page Medrich essays that dot each chapter are made less accessible in two ways: 1 - not indexed in either main or chapter ToCs, 2 - laid out with chocolate brown type on a darkish, greyed lavender background. That color scheme is evocative and delicious used elsewhere in the book for smallish notes. Applying it to more than a dozen solid pages of text in all shows a distressing lack of empathy with readers (and does no favor to the author, either). 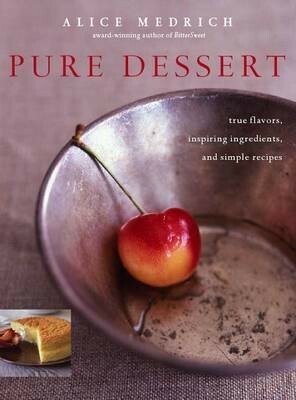 Alice Medrich has become one of my favorite authors despite the fact that chocolate just isn't my favorite dessert ingredient to work with. I think that life is better with dessert or some sort of baked treat. But I find most sweet baking too sweet. I think of sugar as being like a seasoning, too much of it and it overwhelms flavors instead of supporting them. Medrich has provided me with a couple of standby make quickly treats that my husband I just love. Very simple to make, and wonderful with summer berries or stone fruits, or fruit sauce. Delicious and refreshing. I made this after accidentally grabbing some Trader Joe's sour cream instead of cottage cheese, and it was a worthy accompaniment to Ottolenghi's rhubarb and blueberry galette. I'd try using a fancier European sour cream for this next time. Meh. These didn't really rise for me, and I really missed the richness from butter In the biscuits. One of the best poundcakes I have baked. The Kamut flour really makes this one special. This cake is delicious! Actually, all the pound cakes by Alice Medrich are amazing. The texture was spot-on, but the flavour lacked that buttery sweetness of preferred shortbread recipes. One of the best cakes I have ever made. Absolutely delicious (I've made this cake 5-6 times already). A variation on the Rustic Plum Tart, with a flat almond crust that's easy to make and pairs beautifully with purple plums. Excellent effort to outcome ratio, can be made in the food processor. Great almond flavor with nice little fruit pockets from the plums. Again, done much earlier than the recipe states (30 minutes) despite using my light tart pan. If you like sesame this is THE cake to bake. Exotic looking black sesame seeds give this cake a nice little crunch which is a great contrast to the velvet texture of the cake. A wonderful cake with a tight, moist crumb. Use a nice, fruity olive oil as its flavor and that of the sherry come through in the cake. Keeps very well. I made these last night. They're my go-to shortbread cookie (I use half AP and half WW pastry flour), but instead of the cacao nib variation that I usually do I added 1 1/2 Tbsp of jasmine green tea. I ground all but about 1 tsp of it in a spice grinder and added it with the butter and sugar along with the zest of an orange. I sliced the cookies a little thinner than usual and made them into sandwich cookies using a jammy homemade pear butter. I was very happy with these and will definitely make them again! These cookies are easy to make, not too sweet, and were liked by everyone. I like the addition of buckwheat flour here, and I found them difficult to stop eating! The unbaked dough can be held in the fridge for a few days if necessary. I made these as a Christmas cookie this year since we like to have a variety of more rustic looking cookies. Made by hand since I don't have a stand mixer. A breeze to make (no chilling of the dough, no blind baking) and absolutely delicious. Looks beautiful too! This is a good recipe to practice because it works well with other fruits and after doing a few times it becomes something that you can put together in less time than it takes to heat the oven. It did take a bit of practice to be able to press out the dough evenly and thinly. From memory I think I had to moisten my hands to keep the dough from sticking to my hands. I might try sprinkling it with almond flour next time. I should note that my husband loves this VERY over baked - to the point that it is actually difficult to cut with a fork. The butter I was using ( lurpak) is higher in butter fat than american butter. When I accidentally over baked it the crust caramelized creating a flavor that he loved. I really wanted to love this, but as written the recipe does not succeed. (Surprisingly, for a Medrich recipe.) I knew I wouldn't get the same fig flavor with the Brown Turkey figs I had on hand (and I was right). But the big issue for me is that the cardamom was too strong (and I love cardamom). The recipe calls for cracking the pods, extracting the seeds, and stuffing them in your figs. Well, when you do that, you end up chewing through cardamom seeds in every bite- and that cardamom flavor was just way too potent. I would make this again, but use whole pods and remove them before serving. I made this last minute and should have worn my glasses and read more carefully. As a result i had to make on-the-fly adjustments. I had already begun cooking the filling when I realized that there couldn't possibly be enough, as a result I had to begin doubling the recipe half way through the cooking process. I didn't measure, I just added lemon juice and then sugar until I felt that it tasted like the original mixture. I used a pie pan instead of a tart pan, and with the doubled recipe my filling was 1/2 to 3/4 inch thick. If you are using a tart pan you might want to triple the recipe, it is easy to think up ways to use a bit of extra lemon curd. Despite the unexpected adjustments, I would definitely make this again, my husband loved it, very nice and tart. These were the first lemon bars I made for my husband and I don't think I will try out other recipes on him. He loved the sweet/tart flavor of the lemon with the shortbread crust. I think he would find other recipes dull in comparison. I've made these and they are fabulous! The shortbread base is super easy to make (with melted butter). I mixed lime and lemon for the recipe and it tasted great. Awesome recipe. Very strong lemon flavor and shortbread stays crisp for days. An amazing rich flourless torte made by grinding unsweetened chocolate, sugar, and almonds together, bound with eggs whites. A perfect rich ending to a meal. So simple to make, with such a sophisticated flavor. Definitely more of an "adult" dessert. Also flourless and gluten and dairy free, so a great choice for those with dietary restrictions. These little cakes looked quite pretty but I thought the flavor was just okay--the souffle cake by itself is just sweet, without much complexity, though the fresh raspberries do help. Probably won't be repeating this. Made for I's birthday dinner. I did not like this recipe much. The muffins turned out on the heavy side - as much as I like using whole wheat flour in my baked goods sometimes it did not work in this recipe. With its wide range of flavors, beautiful photographs, and deceptively simple recipes that produce astonishingly delicious results, this book is both practical as well as inspirational. I have a lot of cookbooks, but this book is the one that I am always excited to open. It is where I go first when I need something special. The recipes are so elegant and work so well. Alice said it "adds a fragrant buttery flavor and lovely yellow color to baked goods"....enough to get me searching for this difficult-to-find relative of wheat. I tracked it down...so glad I did. This tart is light and refreshing and would be the perfect ending to a meal. It has all of the tart creaminess of a cheesecake without the heaviness. Alice Medrich reshapes the universe of sweets by focusing on fewer but finer ingredients and using them in fresh ways. Always an experimenter, tinkerer, and thinker, the renowned baker and three-time Cookbook of the Year winner Alice Medrich expands the dessert-making vocabulary in Pure Dessert. Using an exciting array of delicate handmade cheeses, wholesome grains, and other ingredients (often ethnic) that are now widely available, she broadens our flavor palate even as she simplifies and demystifies baking techniques. Grains such as buckwheat bring a lovely nutty quality to cookies and strawberry shortcake. Pound cake takes on a whole new identity with a touch of olive oil and sherry. Chestnut flour and walnuts virtually transform meringue. Varietal honeys and raw sugars infuse ice creams and sherbets with delectable new flavor. The desserts that Medrich has devised are not only better-tasting and unusual, but - because they're not heavily sauced or sugared - they're more healthful as well. With eye-catching, full-color photographs that show how easy it is to make these 150 simple, straightforward recipes, Pure Dessert is a revelation.